Have you ever wondered if millionaires have a different mindset? If so, can those of us who are not millionaires (yet) develop the same? If any of you know the beginning of my financial transformation journey, you know I started with a Google search of “How to become a millionaire.” I figured they knew a thing or two about how to manage money. I learned that they not only understand how to manage money, they are not who you think they are! As I studied the habits of millionaires, some of the same traits showed up time and time again. 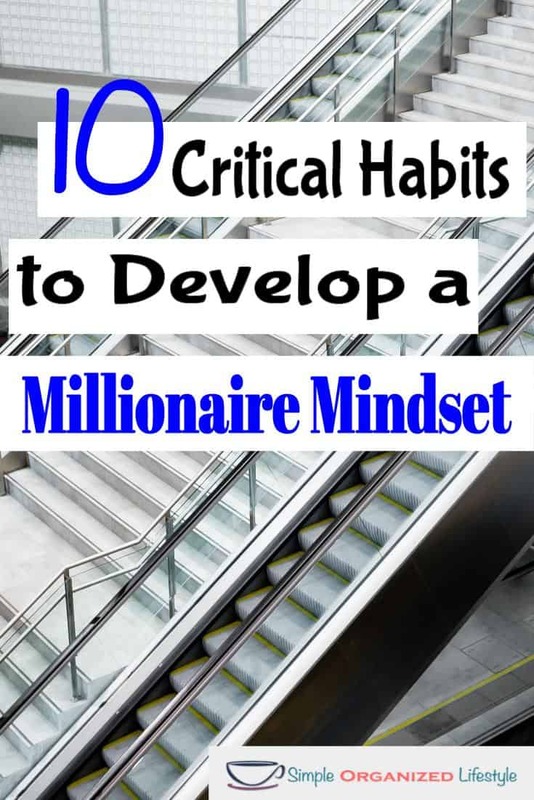 I believe these 10 critical habits to develop a millionaire mindset are keys to building wealth and achieving financial goals. What are these habits? Self-discipline is required to overcome shiny object syndrome, to save more, and to spend less. The same self-discipline to finish what you start. Skipping the daily latte is often easier said than done. But, the millionaire mindset leads you to take the $3/day latte money and, instead, invest that money for 10 years at a 7% return and have over $15,000 saved! That requires self-discipline but comes with a great reward! It may not be a latte, but the idea is the same. We need self-discipline to form new habits and break old ones that are not getting us where we want to be. There is no better time in our history for lifelong learning and, if you want to develop a millionaire mindset, you will take advantage of it. Those who are always learning are always growing, and that includes the wallet! Investments, mutual funds, bonds, Roth IRA, 401K, stocks, CDs, property tax breaks… there’s always something more to learn. This is a great “problem” to have because it means your money is growing and you have to figure out where it can go to grow even faster. Personal finance books are also a great way to invest in yourself by learning more. One of my all time favorites is The Millionaire Next Door , which completely changed my mindset about who millionaires are and how they think. If your income is fixed, then the only way to see more of it is to spend less of it. Those with the millionaire mindset understand that it all comes down to a mathematical equation at the end of the day. They are constantly thinking, How can I spend wisely in order to save daily? Spending less is not as hard as you think. If you pay $60 for a cable TV package, you can trade that for a $20-30 streaming package such as Sling TV and continue to watch TV for half the price! If you want to eat out, you can save by taking advantage of things like “free kids meal with an adult meal” nights and skipping the sodas. You will see more of your income if you find ways to protect it, no matter how small they may seem! Saving more gives you financial options and the ability to avoid loans and interest fees. The millionaire mindset means always thinking about ways to make money grow and work for you! Financial freedom and financing are on opposite teams! The millionaire mindset understands that financing without a strategic plan is not the path to financial freedom. They have a plan A and a back up plan B to protect any type of investment that requires initial financing. You just can’t improve your financial situation with a mountain of debt and economic uncertainties. There are situations (such as rental property investments and business opportunities) when debt can be used as a tool but if you’re not in a good position to do that to begin with, debt becomes a trap and a major risk. I’m a huge fan of Shark Tank, but what is more interesting to me than the actual ideas and inventions, is watching the expressions of the Sharks. Their priority is protecting their investment and it’s clear that this is essential to the millionaire (or billionaire) mindset! In order to get, you have to give. Give to make things better, make people better, make lives better… leave something better than you found it. 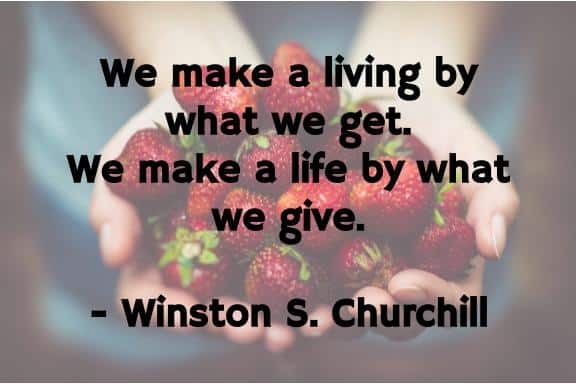 Being a giver without asking for anything in return is part of the millionaire mindset that finds its way back in abundance. Those with a millionaire mindset are happily driving their 2004 Honda Accord. It probably has a nickname like “Baby” and when it reaches it’s very last 275K+ mile, the owner will most likely need some time with it before it goes to the junkyard or makes $100 bucks off Craigslist. No joke. Contentment is a sure sign of a millionaire mindset. It happens when you figure out you can keep your money by investing in things that accomplish the same goal and cost a whole lot less. The latest and greatest is not their priority. This doesn’t mean they don’t buy gizmos and gadgets… but they do it out of choice and not pressure. Achieving new goals, financial or not, takes action. A millionaire mindset translates into taking action on goals and checking off to-do lists, not creating tucked away someday lists. They hustle. They persist. It becomes part of everything they do, and the money follows where the mind takes it. Mr. Millionaire Mindset- Is that a new car in Mr. Jones driveway? Mrs. Millionaire Mindset– Yes, Mrs. Jones said they got a zero percent loan for 72 months. Mr. Millionaire Mindset– But don’t they get a new car every 3 years? Mrs. Millionaire Mindset- Yes (laughing) might be a good deal for us in 3 years. By the way, Mr. Jones needs to borrow your riding lawn mower again. Mr. Millionaire Mindset- (Through a combination of a chuckle and a head shake) goes over to take the lawn mower and check out the new ride. Mr. and Mrs. Millionaire mindset have no resentment whatsoever towards the Jones’ and, instead, are happy to offer any financial advice if asked. The Jones’ never ask. The millionaire mindset of stretching the dollar is not to be confused with being cheap. They simply hunt for bargains and get excited about a good deal. They take vacations, but check to see if the hotel has continental breakfast. If a service is needed that they can’t do themselves, they get more than one estimate. They cancel cable and pay less for a streaming device, such as Sling TV, instead. This doesn’t give us the same visual image of a millionaire on his or her yacht sipping a martini, does it? Millionaires are not who you think they are! Gratitude is a wealth strategy because it’s an investment in yourself and others. The money naturally follows. Millionaires are grateful for what they do have and that has a way of turning into more. A mindset of gratitude is one of the most critical and powerful habits to become a millionaire. 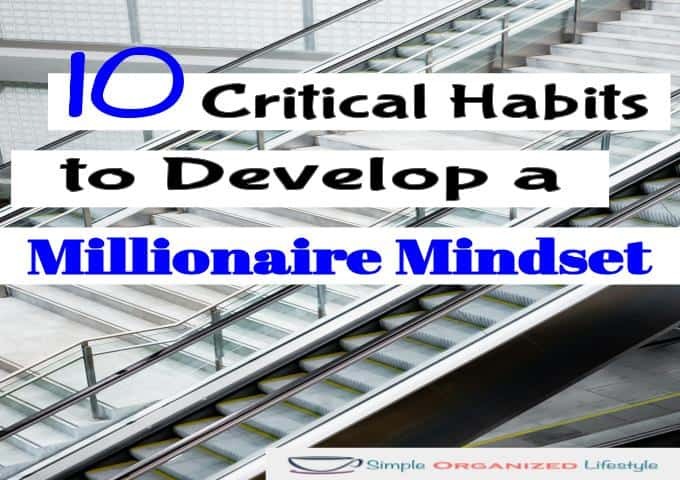 Any other habits to develop a millionaire mindset that are critical to building wealth and achieving financial freedom? Let me know in the comments! I like that you have generosity on this list. It’s a very important part of my financial picture, and it’s reassuring that generosity is part of a millionaire mindset as well! Yes, generosity has a way of making its way back in different forms of ROI, both monetary and not… but good either way! Thanks for your comment! Do-ers, not dreamers. I feel like this is something that isn’t talked about enough. Millionaires (for the most part) get there from some serious hustle. Good post! It’s funny how a “money mindset” can be such a difference between the Millionaires and the rest. It reminded me of the book Rich Dad Poor Dad. Thanks for sharing these habits! Ahhh, yes, another great book about the habits and mindset of millionaires. Thanks for reading Miriam! Good advice. I’m going to have trouble getting past the shiny objects part.! I try to think about the payments or debt that come with shiny objects but it’s hard to do… advertisers/marketers are really good at what they do! I love that you included contentment and generosity in your list! Enjoyed the article. A good reminder for me. Life has been busy lately and sometimes it can be hard to remember to be disciplined about budgeting and watching our finances.